I wanted to let you know officially about the two boosts to our funds we have recently received. You may have heard that the Mt Alexander Shire Council recognised our need for support in their Budget deliberations (front page photo in the Mail before anything was decided) and granted Buda an increase in yearly funding of $5000. Now our total Council funding for the year will be $12,500. We are pleased to have the extra funds to help with our everyday running of Buda and I thank the Staff and Volunteers and our Council Rep on the Board for their work and support in gaining this for us. The other good news is that we have been awarded $50.000 by the State Government in the form of a “Living Heritage Grant” This grant os to be used for urgent tree works, irrigation replacement and re surfacing of paths in the garden. 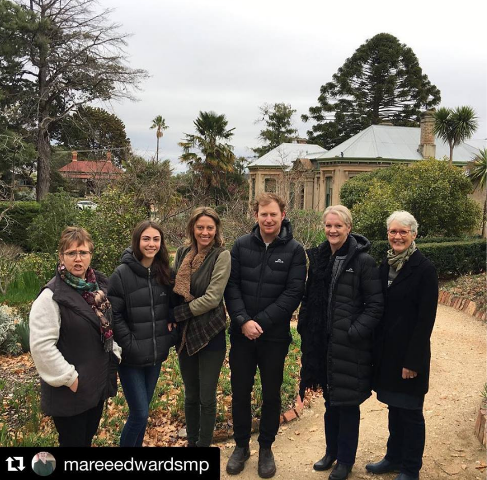 We have been working on finding a way to fund these important works in the garden for years so it is wonderful to have the Government (and particularly Maree Edwards MP for Bendigo West who takes a great interest in Buda) recognise the significance of our natural heritage and support the care of this unique example of an urban garden of the early 20th Century, in a rural town. Thank you to everyone who helped to apply for this funding and we look forward to getting on with the work as soon as possible. There will of course be disruption and much activity in the garden while the work is undertaken but we look forward to a great result particularly for our visitors and our garden workers. Thank you all once again for the many tasks you undertake at Buda and for your love and care of this special place.